I hope you guys are having a wonderful weekend so far! We're going to take a short break from all of the autumn and Halloween themed manis for a moment. I wanted to take some time away to try a new nail art technique and to give my thoughts on the Born Pretty Cute Cat Design plate. Let's start off with a swatch of my base shade. Notes: I entirely regret that I was unable to capture the gorgeous shimmer in this polish. It's absolutely stunning, so you will just have to take my word on it. I used two images from this plate for my look. The first image I used were the cute pawprints along the edge of the plate. The second image was the lucky cat in the middle of the plate. 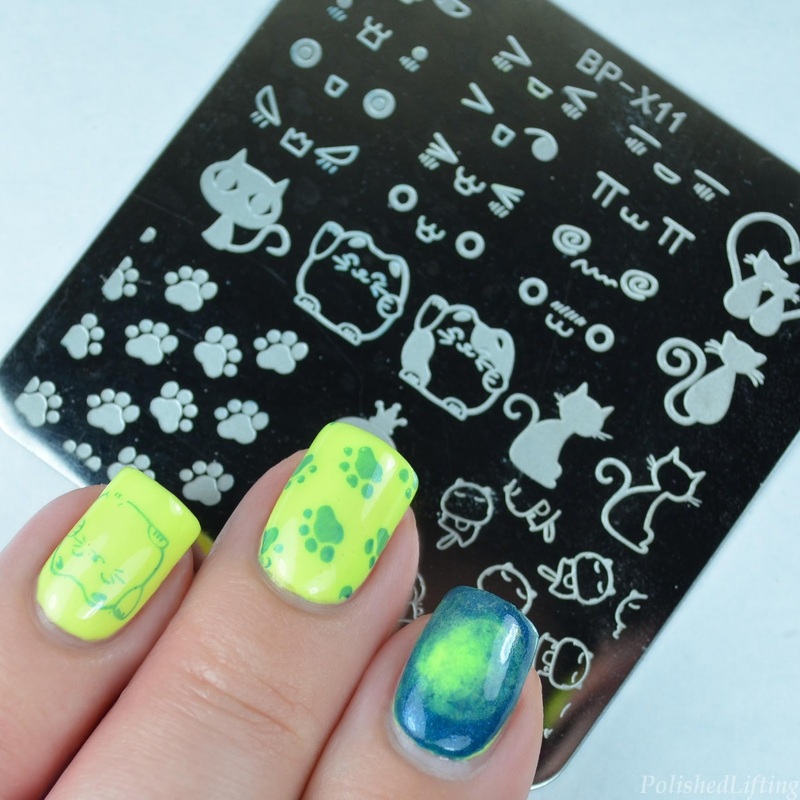 I initially tried to stamp using the spotted lucky cat (right next to it) but I found it difficult to get a clean image with that design. I think that my issues stemmed from the fact that the stamping polish I chose had a thin formula. I don't believe it had anything to do with the plate. I don't know if you guys can tell, but I decided to push myself out of my nail art comfort zone with this mani. I've never attempted a radial gradient, but I thought I would give it a go. Let me tell you, it's far more difficult than I thought it would be. If you guys have any tips for how to complete a successful radial gradient please leave me a comment below. I could definitely use some help! If you find yourself in the Born Pretty Store don't forget to use CBLW10 at checkout for 10% off all regularly priced items. I don't get any financial incentive from the code, but Born Pretty will sponsor a giveaway for you guys if the code is used five times. Pretty sweet, huh? If you liked this post you might like National Coffee Day Mani featuring Born Pretty & Impala, and Bliss Polish Mandala Nail Art.